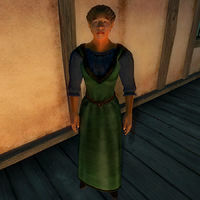 Kiara is a Redguard ostler residing at the Brina Cross Inn outside of Anvil. Even though all the other residents at the Inn are somehow involved with the Anvil Recommendation quest, Kiara is the exception. She really doesn't do a whole lot of things in life, neither eating or sleeping. She can be found standing halfway up the staircase, and her only purpose seems to be watching over a chunk of ham cooking on the grill right next to her. She wears a blue & green outfit with a pair of quilted shoes and carries a small amount of gold. When you address her, she will point you towards the innkeeper with the words: "Welcome to the Inn. If it's a room you're after, speak with Christophe." Esta página foi modificada pela última vez à(s) 19h06min de 4 de março de 2013.